We have been pouring over the charts to find out what to expect over the rest of 2018 and our advanced predictive modeling tools are showing us a few key elements that all traders need to be aware of. So, let’s get right to it. First, the NASDAQ has likely neared or reached its peak near 7400 for the next few months. Don’t expect the NQ to move much beyond 7400 and don’t expect a lot of volatility in the NQ over the next few months. Our research shows the NQ should stall near 7400 and volatility should decrease through September (possibly). Second, the ES/YM/Transportation sectors are poised for a very healthy rally over the next 3+ months or longer. We believe a massive capital shift is underway that will drive capital from foreign markets and tech stocks into Blue Chips, Small Caps and the Transportation sector. Third, the US dollar will likely continue to appreciate towards 122 after a brief price stall near 120.85. 120.85 is resistance that will probably cause the price advance to stall a bit before pushing higher. The next resistance level is near 122 and is our next higher target. Lastly, overall volatility will likely decrease in the general market as price trend continues to unfold. The recent spike in the VIX has a lot of people wondering if we could see some type of deeper market rotation. Our opinion is that these projected upside trends will begin after the July 4th trading week and surprise many traders. Shorts will get squeezed very quickly as this upside trend unfolds. Now, let’s take a look at some charts. 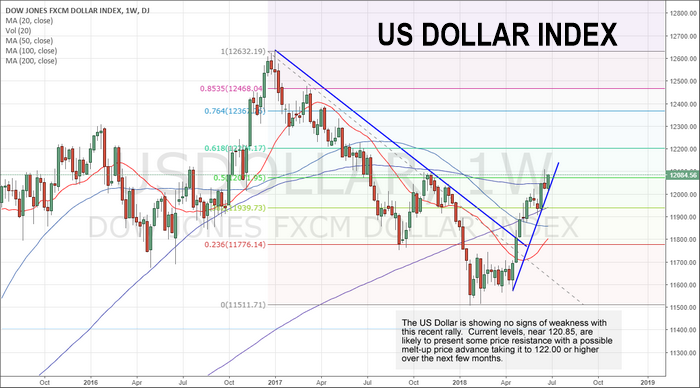 This, a Weekly US Dollar chart, shows the recent price channel breach as well as the clearly defined upside price trend. 120.85 is currently resistance near the 50% retracement level of the previous price downtrend. This level will likely cause the price to stall a bit before advancing higher to the 122.00 level. Overall, until something changes in the global markets or price pushes above the 123.65 level, we expect the US Dollar to continue to advance. 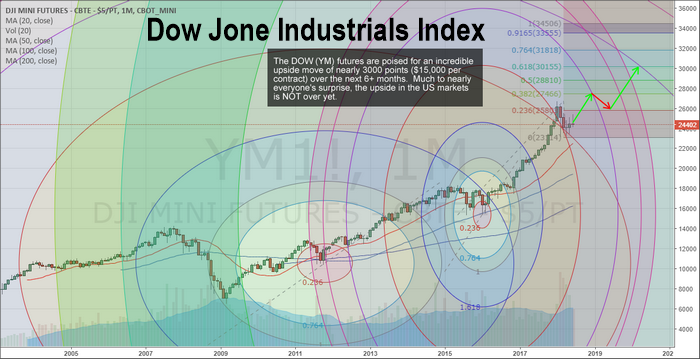 This, the Monthly Dow Jones Transportation Index, shows us the scope and amplitude of recent price swings as well as the price alignment of price rotation over the past 3+ years. Notice that the last Fibonacci Arc Square aligns with price pullbacks and retracements much like the one originating near 2012 through 2014. The point of this exercise is to understand how the price is supposed to react within this expansion and to attempt to predict the future upside targets based on these moves. 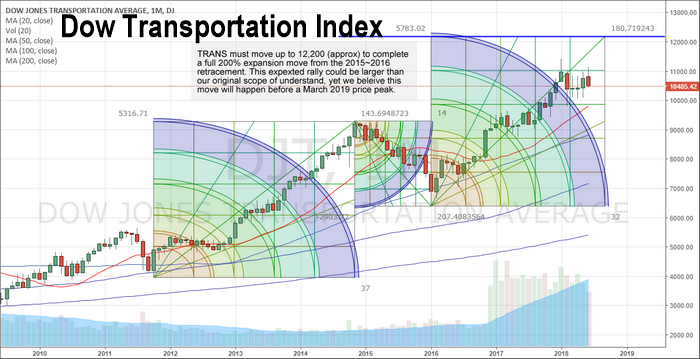 It is our opinion that the Transportation index will rally to near $12,200 before this move is over. The reasoning for this is simple – given current and past price rotation, the alignment of the Fibonacci arc suggests that $12,200 will be the ultimate price peak. Simply put, we just align the Fibonacci arc to price rotation and see where the final outcome for the price is located. Lastly, this Monthly YM Chart shows us a very clear picture of what to expect over the long term if our predictive analysis and projected price/cycle analysis is correct. The YM should rally to new highs before the end of this year while potentially stalling near the end of 2018 or within Q1 of 2019. This stall/peak formation will result in a slight price correction (of likely 3~6%) before prices, again, begin another upside move. These Fibonacci price circles help us determine projected price targets as well as assist us in understanding current and past price rotation. The key to all of this is overlaying different analysis and predictive modeling systems that help us understand what to expect in the future. From this analysis, we can then take at look at these types of “trigger point models” that helps us to understand where and when the price may attempt to reach peaks or troughs. The current price rotation in the market, with the ES trading near 2720, would indicate that the ES, YM and other Blue Chips may be setting up for a massive upside move. The YM alone could rally nearly +3000 points ($15k per contract) and the ES could rally +100 points (+$5k per contract) over a fairly short period of time (3~8+ weeks). This is a tremendous opportunity for traders. Get ready for an incredible opportunity for profits and let us help you stay ahead of these moves. Please take a minute to visit www.TheTechnicalTraders.com to learn how we can help you find and execute better trading solutions, better research and provide a top-tier solution for active traders. If you like our research and find it helps you, then consider joining our other valued members in supporting our work and taking advantage of our solutions for active traders. Want to know where this market is headed and what to expect throughout the end of this year and beyond – our members already know what our predictive modeling systems are suggesting for the next 5+ months. Do These Charts Make Sense or Confuse You? It doesn’t matter, just use our easy to follow trade alerts complete with entry, stop, and price targets! JOIN NOW AND TRADE LIKE A PRO!